The United States Government Organization Manual is an omnibus reference to the federal government. (In the mid-70s the title was simplified to just the United States Government Manual). Published annually by the Federal Register, it contains the text of the U.S. Constitution, the Declaration of Independence, listings of members of Congress, descriptions of the purpose and functions or departmental agencies and their major subdivisions, government contact information, and various other reference documents that might have come in handy if you were a government employee in the days before such things were just a Google search away. 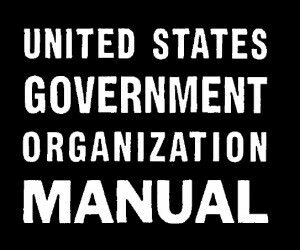 If you want to find who held what position when in the U.S. government, the U.S. Government Organization Manual is uniquely useful. But for the historian, the manuals have some information that simply isn’t compiled anywhere else. In particular, the main office holders in each government agency are listed for that year (the manuals are published annually). There are also org charts for government agencies and departments, which can come in handy because many of them changed over time. So if you want to know who the Director of the Office of Chinese Affairs in the Office of Far Eastern Affairs in the State Department was in 1966, or who was White House Chief Usher in 1961, this is the place to look. And you can also do the reverse. If you have a name and are looking for his or her position, you can search in the name index and find their official job title. The Manuals are published in June of the first year in the title (for example, the 1967-68 edition was published on June 1, 1967). So if you want to know who was in such-and-such a position in early 1968, your safest bet is to get the 1968-69 edition in case they changed jobs. Manuals since 1996 are available online through GPO Access.